BOSTON (Reuters) - John "Jack" Bogle, the founder of index investment pioneer Vanguard Group Inc, changed Wall Street by convincing millions to turn away from mutual funds that actively pick stocks, but his legacy will also be shaped by the unintended consequences of index funds. 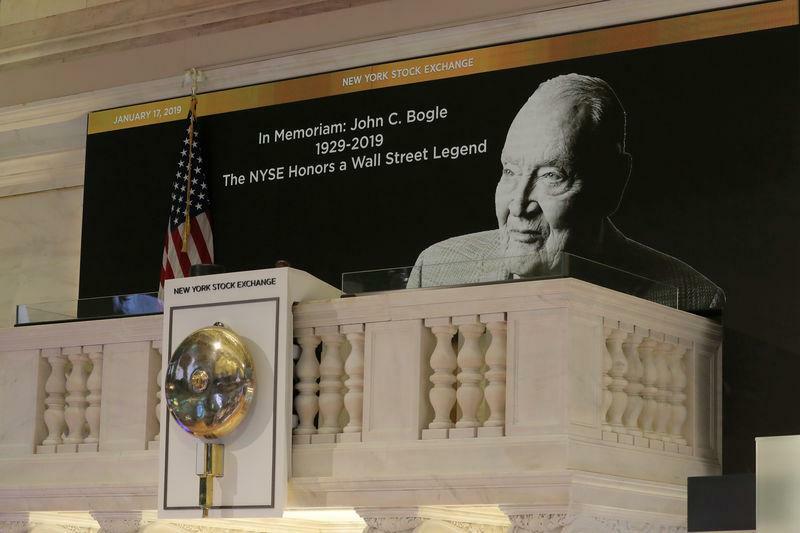 Bogle, who died of cancer at age 89 on Wednesday, saved investors billions of dollars by devising and championing low-fee funds that tracked markets instead of trying to beat them. However, now that index funds and similar exchange-traded funds hold roughly $6.7 trillion (£5.2 trillion), or 35 percent of long-term fund assets, concerns are rising that the products may reduce competition, distort markets, or prove too deferential to management and corporate directors. As recently as 2007, index funds and ETFs accounted for only 15 percent of long-term fund assets, according to the Investment Company Institute. The 2007-2009 financial crisis buttressed Bogle's view that in the long run low-cost passive vehicles hold fundamental cost advantages over actively managed funds. Only 44 percent of active managers outperformed their benchmarks during the period, according to Vanguard's research. A generation came to believe active managers could not prevent losses, said Todd Rosenbluth, senior director of mutual fund and exchange traded fund research at New York based CFRA. Such products allow short-term bets that are inimical to Bogle's buy-and-hold philosophy. "We now have strategies that are the opposite of buy and hold and we have fee structures that encourage much more tactical trading than he had hoped would happen," Rosenbluth said. Another challenge facing index funds is how they will fare in volatile markets. In theory such conditions should favour active traders who can hop into undervalued companies and sectors. For instance, as markets sank in 2018, the total return of Fidelity’s famed Contrafund [FCNTX.O] beat the S&P 500 index by 2.26 percentage points, a representative performance among large growth funds. Still, the passive side is holding up: In the month of December passive funds received net deposits of about $60 billion, while investors pulled a record $143 billion from actively managed funds, according to Morningstar. For all of 2018 Vanguard led the industry with $161 billion in net deposits, followed by $136 billion to BlackRock Inc's iShares line. Together the five largest Vanguard funds saved investors at least $5 billion in fees in 2018, compared with what they would have paid to keep the same assets in the largest active funds, estimated industry consultant Neil Bathon. Even after Bogle left Vanguard’s board of directors in 1999 he remained a tireless advocate for index funds. "It is quite rare to find people whose principles and conviction are as closely aligned in their personal and professional lives as they were with Mr. Bogle," Bathon said. The rapid growth of index investing has also given rise to concerns they could reduce the incentives for competition at the companies they own, or weaken proxy voting pressure on corporate directors. In a recent paper, professors Lucian Bebchuk of Harvard Law School and Scott Hirst of Boston University Law School argued index fund managers have strong incentives to "defer excessively to the preferences and positions of corporate managers," in return for benefits like managing corporate pension money. Even Bogle himself had become critical of the power of the behemoth he created. In a November opinion piece in The Wall Street Journal, Bogle warned the continued growth of Vanguard, BlackRock and State Street would become problematic. Soon the three firms could own 30 percent or more of the U.S. stock market. "I do not believe that such concentration would serve the national interest," Bogle wrote, noting how such a move would concentrate voting power with just a small number of executives. Jeff Ptak, Morningstar's head of global manager research, said Vanguard hardly represents a risk to market stability at its current size, but credited Bogle with raising "constructive concerns" about the growing influence of passive funds. The biggest risk posed by Bogle's approach to investing, said another Morningstar analyst, Alec Lucas, "is to the profit margins of the average active manager who underperforms after fees." Is Oppenheimer Developing Markets A (ODMAX) a Strong Mutual Fund Pick Right Now?